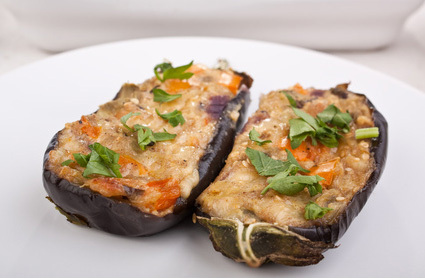 If you find aubergines a bit bland this is a great way to enliven them, with spices. The zesty lemon and the fresh coriander work so well together. Mix coriander and spices together. Slit aubergines 4 ways halfway down. Put in a casserole dish and then make up the sauce. Heat the two tbsp of oil in a frying pan and add the mustard seeds, tomatoes and lemon juice.